Japanese electronics firm Maxell have released a pair of new speakers for the home. Today, we’ll be reviewing the first and cheaper of the pair – the MXSP-WP2000. The WP2000 is an interesting proposition, combining two functions into a slim and stylish chassis. Firstly we have the speaker itself, which can be connected to via Bluetooth or a 3.5mm audio cable. 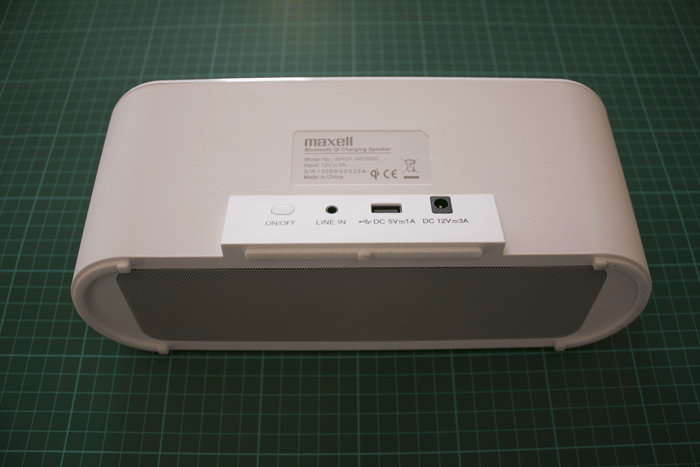 Secondly, the WP2000 also works as a charger, either wirelessly using the Qi standard or via with a cable connected to the USB port on the rear of the speaker. No batteries are on board, so you’ll need to have this speaker connected to the mains for use. The MXSP-WP2000 certainly looks capable, but you’d expect that from a speaker that retails at £120 from Amazon. In this review, we’ll see whether the premium price point is justified through aural performance, ease of use and style. The Maxell sits between vintage and contemporary. The shape is sensible, but not one I can describe with a single word. Imagine a wide but short rectangle, with extremely rounded corners that form a circle at each of the ends: an oblong. Extrude this shape directly upwards, then push the top plane away from you a bit. You end up with a curved, soft shape that leans back, pleasing but inorganic. 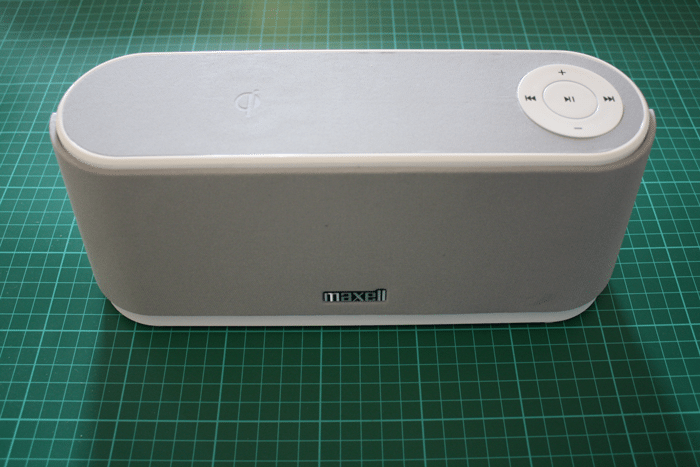 The white model I was provided with uses gray speaker cloth on the front, with a metallic maxell logo centred near the bottom. The speaker grille extends around the curve of the front, stopping exactly half-way along the sides. The white plastic outside of the speaker cloth is matte and textured, with a shiny white ridge running around the perimeter of the top. 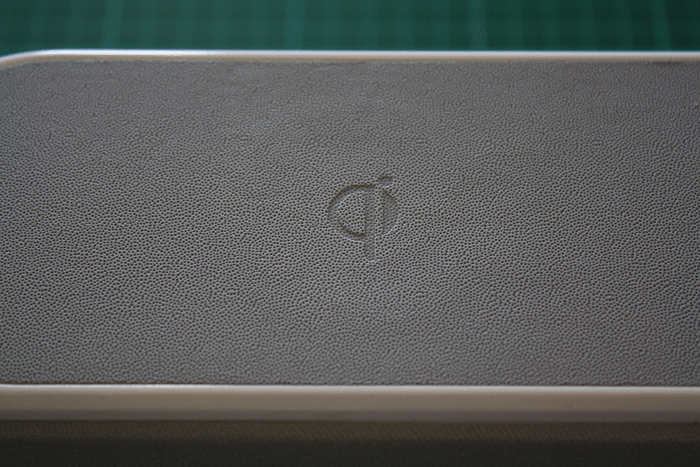 The top is made from a soft touch material, with a Qi logo about a third of the way from the left, and a circular touch-sensitive control surface inset on the right hand side. This is divided into two concentric circles, with play/pause in the centre and four controls in the outer circle. Volume up and down sit at the top and bottom, while skip back and forward are at the left and right. The back of the device has four important elements, positioned on a near-vertical surface that extends out of the rest of the speaker. These elements are the on/off button, a line-in 3.5mm port, a USB port providing 1A and the power input. 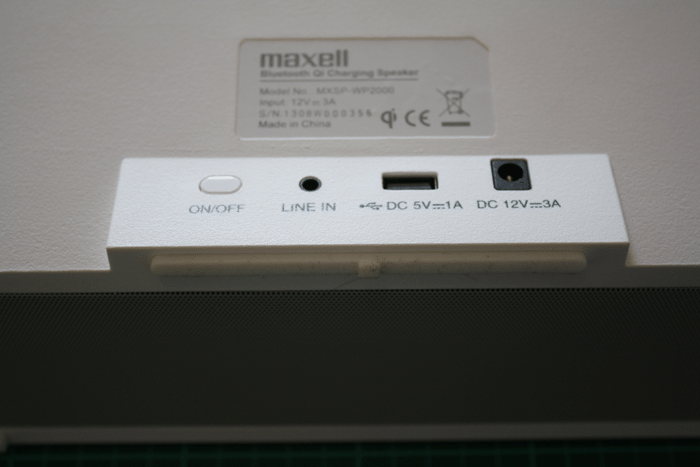 Above these, a small label affirms that this is a Bluetooth Qi Charging Speaker made by Maxell, and states the model number and various regulatory information. On the base of the unit, we see a large grille in grey. Rubber anti-skid feet lie along the curved sides and below the buttons and ports on the back of the device. A remote control is also included, providing access to playback controls from a distance – useful if your smartphone is charging and therefore can’t be easily taken away from the speaker itself. In order to test the speaker’s capabilities, it was used for a period of around two weeks for playing music and charging phones. A wide variety of music was used, from lighter ambient and classical pieces, through to mid-range options such as rock and K-Pop, and into more bass-heavy electronica, metal and hip-hop. A speaker’s primary element is its aural quality, and it’s that we’ll discuss first. Generally, we found the speaker to be fairly well-tuned and loud, able to provide a room-filling sound without distortion. It’s not quite loud enough for a proper house party, but it’s certainly enough for playing music for a few friends or in the background. The biggest disappointment of the speaker was its performance on bass-heavy tracks like Tupac’s California Love or Daft Punk’s Around the World, where it felt rather anaemic. The 1812 Overture is mostly well presented, but the cannon fire is noticeably muted. Otherwise, the speaker is of a good standard, with most classical, rock and K-Pop pieces tried sounding quite good for the speaker’s small size. It’s worth noting that Bluetooth connections, even with the benefit of aptX, seemed to sound quieter and slightly worse than a wired 3.5mm connection. Of course, this isn’t just a speaker – this is also a charger. Wireless charging is still relatively rare on phones, but can also be added to some models with accessories. The Nexus 4 and 5 do include wireless charging, and this worked well on the WP2000. Alignment takes a few seconds initially, but once you find the right position you can place the phone down correctly without much thought. Of course, you must also be sure that you check that it is indeed charging, as there’s no indicator of this on the speaker itself. Wireless charging seems as fast as the wired option here, so it makes sense to use it if your phone is capable of it. Wired charging is also quite straightforward. The 1A provided here means that most modern phones will charge fairly slowly, so you may find the 1.2 to 2.0A adapter provided with some models will allow you to recharge faster. In terms of usability, the Maxell scored highly. Pairing your phone to the speaker is very quick if your phone has NFC, as you can just tap your phone on the front of the speaker to pair automatically. 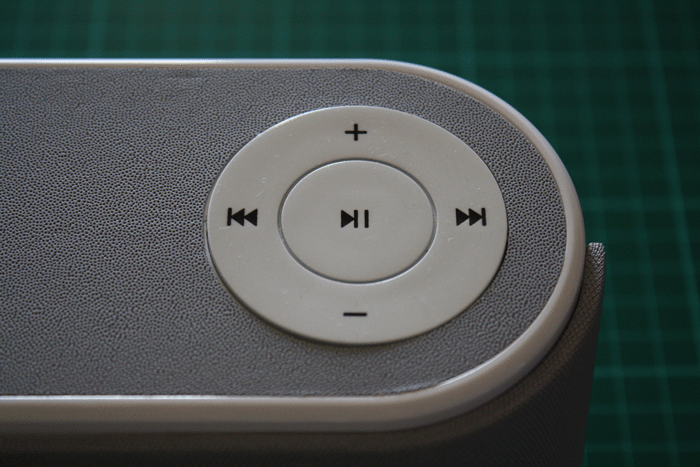 From then on, you can control playback from the phone, speaker or remote as is convenient. The only really inconvenient part was reaching behind the speaker to hit the small lozenge-shaped on/off switch. While this placement keeps the speaker looking tidy, it’s a bit of a pain depending on your positioning of the speaker. Is the Maxell MSXP-WP2000 a good investment? It depends very much on what you intend to use it for. If you prefer music that is light on the bass, then you’ll find good aural performance across the board. If you have Qi wireless charging on your phone, you’ll find the WP2000 a convenient vessel to charge your phone. On the other hand, if you have bassy tracks in your library or you don’t have wireless charging on your phone, then that £120 price point is too high to really justify.